Amid recent violence, harassment, threats and red baiting against its members, the National Union of People’s Lawyers (NUPL) filed a petition for writs of amparo and habeas data with the Supreme Court this afternoon. Named respondents were President Rodrigo Duterte as commander in chief of the Armed Forces of the Philippines (AFP), National Security Adviser Hermogenes Esperon Jr., Defense Secretary Delfin Lorenzana, AFP Chief of Staff Gen. Benjamin Madrigal Jr., Deputy Commander for Intelligence of the AFP Brig. Gen. Fernando T. Trinidad, Intelligence Service of the Armed Forces of the Philippines (ISAFP) Chief Maj. Gen. Erwin Neri, Philippine Army Commanding General Lt. Gen. Macairog Sabiniano Alberto and AFP Deputy Chief of Staff for Civil Military Operations Maj. Gen. Antonio Parlade, Jr. The group said that some of their members have been in the line of duty. The NUPL has also asked the high court to compel the respondents, under the Writ of Habeas Data, to produce and, if necessary, to update and rectify, or to suppress and destroy, data, information, and files in their possession, under their control, or contained in their data base which relate to or concern them. Members and officers of the NUPL troop to the Supreme Court to ask for protection from relentless military red-tagging led by Brig. Gen. Antonio Parlade Jr. The red scare tactics have intensified in recent months, with NUPL members being subjected to surveillance and various forms of threat, harassment and intimidation. The most vicious attack was the murder of Atty. Ben Ramos in Negros last year. In his last days alive, Atty. Ben was red-baited in anti-communist posters which showed his photo together with those of activists in the region. Members of the legal profession could be in more danger due to an Armed Forces of the Philippines (AFP) official’s claim that the National Union of People’s Lawyers (NUPL) had alleged links with communist rebels. “Such reckless claims, on top of the public labeling and vilification of our members, has put the judges, prosecutors, public defenders, law professors, gov’t lawyers, law students and paralegals who belong to our voluntary pro bono organization in even more danger,” NUPL President Edre Olalia said in a statement on Friday. Olalia’s statement was issued after AFP deputy chief of staff for civil-military operations Brig. Gen. Antonio Parlade Jr. accused the NUPL and other local organizations of having links with Communist Party of the Philippines (CPP) and the New People’s Army (NPA). Olalia even warned the AFP official that members of the NUPL will face him in court to question the credibility behind the allegation. “Absent any credible, competent and admissible evidence to even remotely give a semblance of veracity to this unabashedly fascist claim, we shall hale you to court. And you better match our best lawyers money cannot buy with your best lawyers money can buy,” Olalia’s statement read. NUPL records show that from September 2016 to November 2018, a total of 24 lawyers have been killed, 15 of which are still unresolved. A delegation of foreign lawyers has asked President Rodrigo Duterte to protect, and refrain from “publicly attacking,” lawyers, after it found a “sharp increase” in human rights violations against legal professionals during the current administration. The President should instead publicly condemn attacks, the nine-member delegation said after conducting a brief study of 13 violent incidents against lawyers in the last two years. As part of their study, the delegation, whose members come from Belgium, Italy, Japan, South Korea, the Netherlands, and the United States, also interviewed officers from the Department of Justice and the National Bureau of Investigation, which they said recognized the problem but seemed “frustrated” about local investigations. At least 37 lawyers have been killed in the line of duty since the Duterte administration began, according to the count of the National Union of People’s Lawyers, one of the local groups that hosted the international mission. It was so for real. And it stared at us right in our faces. The International Delegation. 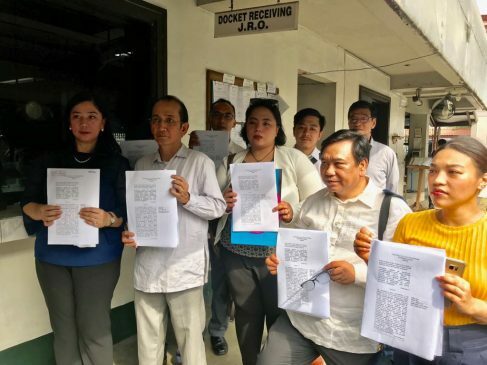 of Lawyers which just concluded a Colloquium and issued a critical Initial Findings on the query into the attacks on Filipino judges, prosecutors, lawyers and paralegals was itself the subject of brazen threats, harassment, and surveillance yesterday. At the press conference at the Integrated Bar of the Philippines (IBP), a man in civilian clothes who identified himself as a military personnel approached an IBP staff and boasted that “these foreigners are now under surveillance.” Afterwards, he milled around the Delegation and was not-so-discreetly taking our pictures and snooping on our conversation. Meanwhile, a woman in sloppy civilian clothes was also close by and was looking ill at ease, reporting at the top of her voice to somebody over the phone. When asked by our hosts to identify herself, she claimed to be a media person but could not produce any form of identification at all. by two men in bullcaps riding in tandem on a motorcycle with no plate number. We were tailed until we reached our hotel where more men in civilian clothes and bullcaps were posted at both entrances, obviously stalking us and peering into the lobby and monitoring the ingress and egress of people and vehicles. When one of the men visibly posted close to the entrance was confronted by the hotel security, he claimed he was waiting for his relative to check in though he was just standing outside pounding incessantly on his mobile phone for several hours already. We learned that he actually left for the night. Also, a member of our host committee was also tailed presumably by the same group of people when she left the hotel. Earlier today, a heavily tinted car parked at the basement of the hotel tailed the vehicle of our Delegation even while motorcycle-riding men were idly posted at the hotel’s street corner. We were made to understand that our Delegation was probably the first foreign group to enter the country and conduct a firsthand open inquiry on the reported rights violations under the present Philippine government. Under the contemporaneous circumstances and in the context of the usual reaction of the Duterte government towards opinions inconsistent with its official line, these vexatious acts against our Delegation appear to have the fingerprints of intimidation and reprisal by State agents. It is indeed ironic that our lawyers’ delegation representing various legitimate and prestigious organizations from all over the world which openly met with government offices and officials – other than the police and military which gave us a runaround – will be subjected to brazen harassmen ourselves. made time to see things firsthand on the reported attacks on our peers and brethren out of genuine concern and who in good faith humbly put forward concrete recommendations for consideration by the authorities are ourselves the object of attack. The respective embassies and missions of the members of our Delegation, the various international lawyers groups which organized, participated, supported and endorsed us, and the international community have been put on notice of this unacceptable harassment. An international delegation of lawyers organized by the International Association of Democratic Lawyers (IADL), Union of International Advocates (UIA), and Day of the Endangered Lawyer Foundation who arrived in the Philippines to look firsthand into the targeting of lawyers and other legal professionals shared their initial findings today at a press conference at the Integrated Bar of the Philippines. (d) That the practice of filing fabricated charges to pressure, harass, discredit and intimidate lawyers is prevalent. The group also concluded that these have created a climate of fear and intimidation preventing or obstructing lawyers, judges and prosecutors from exercising their profession. Members of the Delegation raised concerns over patterns suggesting a connection between the killings of lawyers and the actions of the police and the military. The group humbly put forward a list of initial recommendations in their sincere desire to protect their peers and brethren, to ensure the independence of judges and lawyers, and to uphold basic due process for all, including those of critics and dissenters. It called on their colleague the President to refrain from publicly attacking fellow lawyers and urged him to publicly condemn all attacks against lawyers and other members of the legal profession and to abide by the UN Basic Principles on the Role of Lawyers. The Delegation was participated in by the Confederation of Lawyers in Asia and the Pacific (COLAP), National Lawyers Guild (NLG) of the US, Progress Lawyers Network (PLN) of Belgium, Italian Democratic Lawyers, Japanese Lawyers for International Solidarity and Action (JALISA), and MINBYUN-Lawyers for a Democratic Society of Korea. Haldane Society of Socialist Lawyers of UK, European Lawyers for World Human Rights and Democracy (ELDH), Dutch Lawyers for Lawyers, European Democratic Lawyers (AED), Hellenic Union of Progressive Lawyers (HUPL) of Greece, Italian National Bar, Dutch League of Human Rights and the International Association of Peoples’ Lawyers (IAPL). Alarmed with the attacks on lawyers, judges and prosecutors in the Philippines, nine foreign lawyers from six different countries have come to the country to conduct their own investigation. The fact-finding mission is composed of lawyers from Belgium, Italy, Japan, Korea, the Netherlands and United States. Suzanne Adely of National Lawyers Guild (NLG) of the U.S, and International Association of Democratic Lawyers (IADL) said the delegation is hoping to collect information and answers from government institutions about the alarming rate of extrajudicial killings of lawyers and judges. According to the Integrated Bar of the Philippines (IBP), 38 lawyers have been killed under the Duterte administration. On March 14, another lawyer, Rex Jasper Lopoz, was gunned down in Tagum City. Adely said their mission will focus on the extrajudicial killings of lawyers. “We cannot expect to be able to fight for justice if we cannot protect the peoples’ lawyers,” Adely told Bulatlat in an interview. A trade unionist based in New York, Adely said she has been active in solidarity work with Filipinos in the U.S. and has learned about the political situation in the Philippines from her Filipino friends. “I always knew that I would come at some point,” she said. Also joining the delegation is Johannes Karel Geesbaak, director of the Foundation for the Day of the Endangered Lawyer, who joined similar missions in the country during the Gloria Macapagal-Arroyo administration. “The situation has not changed since the last time,” Geesbaak said during the colloquium held at the IBP building, March 15.
International fact-finding missions investigating the attacks on Filipino lawyers were conducted in 2006 and in 2008. The 2008 mission noted little or no progress has been made in the cases investigated in 2006. PRESIDENT RODRIGO DUTERTE’S misconception of the role of lawyers in society has largely contributed to the continuing attacks and threats on the legal profession. This was highlighted during the Colloquium on the UN Basic Principles on the Role of Lawyers: Focus on the Philippines held yesterday March 14 at the Integrated Bar of the Philippines (IBP). Over the past three years of Duterte’s administration, at least 37 lawyers, judges, and prosecutors – or more than one per month- have been killed since President Duterte assumed power on 1 July 2016. At least 26 incidents of other forms of attacks and threats have been recorded. Day of the Endangered Lawyer Foundation Director Hans Gaasbeek of the Netherlands aired the same sentiment. Gaasbeek emphasized the need for governments to educate not only the people but also the police on the role of lawyers. Meanwhile, the president of the Philippine Judges Association (PJA) believes that the government is doing its best to address the killing of judges. Judge Felix Reyes Jr. discussed how the Supreme Court deals with the killings and attacks on the members of the Judiciary. He said that the Supreme Court had issued an administrative order detailing the actions a judge may take to secure his life. The PJA has recorded at least 29 judges killed from 1999 to 2018. National Union of Peoples’ Lawyers (NUPL) and the IBP were requested to host the 9-member Delegation of lawyers from Belgium, Italy, Japan, Korea, Netherlands and the US. The International Delegation of Lawyers to the Philippines is organized by the IADL, UIA, DELF and supported by the Confederation of Lawyers in Asia and the Pacific (COLAP), National Lawyers Guild (NLG) of the US, Progress Lawyers Network (PLN) of Belgium, Italian Democratic Lawyers, Japanese Lawyers for International Solidarity and Action (JALISA), and MINBYUN-Lawyers for a Democratic Society of Korea. Hellenic Union of Progressive Lawyers (HUPL) of Greece, Italian National Bar Association, the Dutch League of Human Rights and the International Association of Peoples’ Lawyers (IAPL) also endorse the activity. The Delegation wishes to know the reasons and causes of various forms of attacks against Filipino lawyers, share opinions on recommendations to abate further attacks, and remind the auuthorities of its obligation to ensure that lawyers are able to perform all of their professional functions without intimidation, hindrance, harassment or improper interference.